A United Launch Alliance Delta II rocket will launch the first spacecraft in the Joint Polar Satellite System, inaugurating the next-generation series of polar-orbiting weather satellites for numerical weather forecasting and scientific application. NASA is responsible for the development of the JPSS satellites while NOAA operates the satellites, analyzes and distributes their data. Delta II will be flying in its 7920 configuration with nine Solid Rocket Boosters around its RS-27A powered first stage with a Delta-K stage sitting atop and no third stage. This will be the penultimate flight of the venerable Delta II booster as is prepares to close a career of three decades. 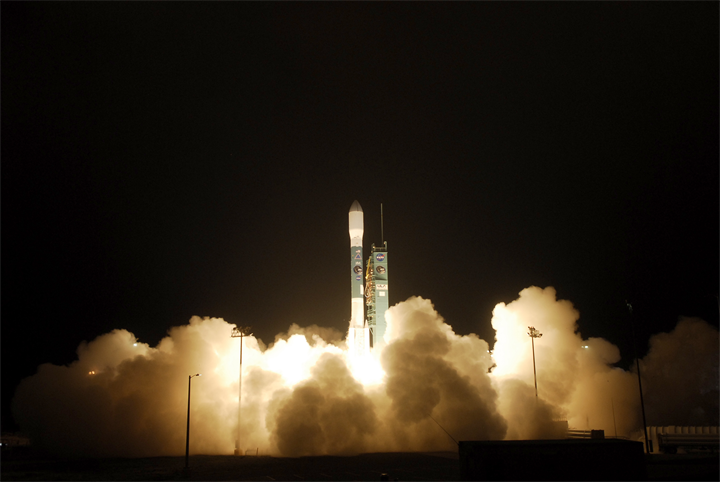 The ULA Delta II rocket carrying the JPSS-1 mission for NASA and NOAA is delayed, due to a faulty battery. The delay allows the team time to replace the battery on the Delta II booster. The vehicle and spacecraft remain stable. Launch of the JPSS-1 mission is scheduled for no earlier than Tuesday, Nov. 14, 2017.